Employee Assistance Programs Blog: America's First and #1 EAP Blog*: Is Your Quarterly EAP Newsletter Placing Your Program in Danger of Being Cut? Is Your Quarterly EAP Newsletter Placing Your Program in Danger of Being Cut? What a weird question? Well, it's one of the many elephants in the EAP living room, so let's discuss it. Can an EAP newsletter that you distribute too infrequently make your program less visible and more likely to be cut? After communicating with hundreds of EAPs and watching what happens internally with EAPs that I have managed, I have slowly gravitated to an answer on this question. It’s “yes”. It’s convenient not dealing with the distribution of a newsletter more often, but still appearing as though you are “doing something” to promote your EAP. Is this your mindset? This vintage approach to communicating wellness information in a technological era has become almost an apologetic frequency as your newsletter sheepishly slips into employee in-boxes every three months. I would like to make the argument that this is too infrequent and makes a statement about the importance of this material and your program, in particular. Do you disagree? Consider why you do this. Is it because there is a history of EAPs always doing it this way because that is all that was initially available from vendor sources? So, by default, did it become the standard for EAPs, and you copied others? I think this is precisely what happened. Since I joined ALMACA (EAPA’s early name) in 1978 – 32 years ago I have witnessed the evolution of this service. And, I have watched it grow more important. With all the stress that employees face, and with the degree of importance that you place on your EAP as a life-saving and cost-saving mechanism, isn’t it a bit ironic that you only distribute a quarterly newsletter to employees when you could do it bimonthly or monthly for less, and with less hassle? You may have a quick comeback — employees have too much to read! Don’t fool yourself. This is your codependency talking. You're giving in to a HR manager’s phone call telling you to slow it down about other material you may have sent. Or it's simply your imagination, because you haven't received such a phone call at all. You're just making this statement to avoid the work and it sounds damn good. I have caught many EAPs in this argument. It's not reality. This, too-much-to-read line is bogus. If you are hearing this line, it is all about muscling you around and telling the EAP how to do its job. Why is that the most important thing employees read regarding their well-being and perhaps the one thing that they really look forward to most receiving, is the one thing that should be cut back? What you’re hearing from HR, if indeed at all, is one HR manager’s opinion, or at best a manager’s opinion relayed via HR. You need to understand something: HR managers don’t argue with top managers. They are their primary customers. Instead HR managers ask how high to jump. Corporations are on a big outsource-the-HR-departmet kick these days, and HR managers -- like EAPs are a threatened species. I assure you that you are not getting the results of a survey that is supported by employee opinions. Here’s the problem. Employee newsletters have historically been four pages. The problem begins and ends there. Quarterly newsletters are always print or sub-links to the vendors own web site destroying your seamless look. They are expensive, with 500-600 word articles, and they are a vintage solution manufactured for EAPs in the early 1980’s when anything more frequent would be over-kill. Employees had more leisure time then to read these "books". But the problem today is that they sacrifice your EAP or program visibility. You become less competitive with other things in the organization. You don’t want that. It will jeopardize your program. You are sacrificing visibility and communicating the message that quarterly life-saving health and wellness information is quite enough. Trust me, you do not want to send this message. 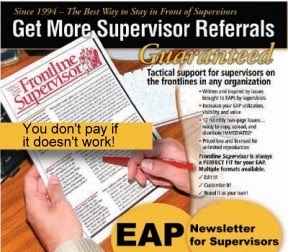 An EAP newsletter is a resource, and visibility mechanism, and item of extreme interest to employees. And it is a way to compete against other things in the environment that are targeting the employee’s attention. You must not give in to the “stop distributing this material because our employees don’t have time to read it” mantra. Instead, stop sending 4-page newsletters. Send two-page newsletters bimonthly or monthly. Employees do not generally finish or complete four-page newsletters in my experience and in my view. This is another reason that you are locked into a 4-page solution distributed quarterly. It’s nuts to send it more often! And its expensive. So, change the model to the 2010 solution. Get out of the 1980's. In this era, go for less content, shorter more action-oriented tight copy, and more frequency with the ability to edit the content yourself on the fly. This way your EAP will stay visible, be perceived as being more valuable and relevant, and be more effectively mainstreamed. Anything less and you’re in danger of being seen as expendable during next budget cycle. 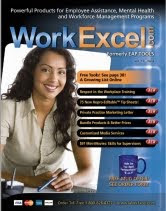 Distribute EAP-wellness-productivity newsletters via PDF. Post them on your web site and send a link to employees when they are added to the site. Distribute print to employees without computers, or send copies to appropriate locations. Your utilization will increase, your visibility will be enhanced, you will spend less, and employees will read more, more frequently. Your EAP will be talked about more often, and this is what you want. A two-page monthly newsletter is 50% more content than a quarterly four-page newsletter! (Read that again.) And, the two-pager is more likely to be completely read. Are you with me? You’ll will also reduce waste, motivate more self-referrals, and reduce more risk to the organization with a two—pager, monthly newsletter. Oh, and it will cost less than print. Everything I am writing here is pure logic and it holds up in real life. Still need paper, make copies from your clean PDF supplied by the vendor. Can’t get permission from the vendor? Dump the newsletter vendor! 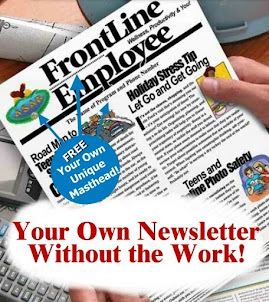 FrontLine Employee and WorkLife Excel are your modern day solutions to effective employee and EAP newsletters.